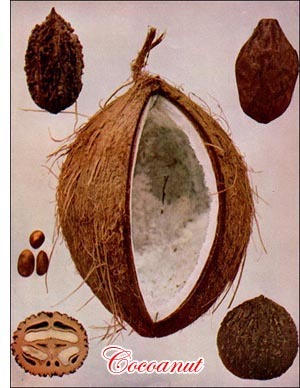 The fruit of the Cocoanut Palm, which is the most useful tree of all its tribe to the natives of the regions in which it grows, is one of the most valuable and important of commercial products. On the Malabar and Corvomandel coasts of India the trees grow in vast numbers; and in Ceylon, which is peculiarly well situated for their cultivation, it is estimated that twenty millions of the trees flourish. The wealth of a native of Ceylon is estimated by his property in cocoanut trees, and Sir Emerson Tennent notes a law case in a district court in which the subject in dispute was a claim of the twenty-fifth twentieth part of an acre of palms. The tree is very beautiful and lofty, growing to a height of from sixty to one hundred feet, with a cylindrical stem which attains a thickness of two feet. It terminates in a crown of graceful leaves. The leaf sometimes attains a length of twenty feet, consists of a strong midrib, whence numerous long, acute leafllets spring, giving the whole, as one traveler described it, the appearance of a gigantic feather. The fruit consists of a thick external husk or rind of a fibrous structure, within which is the ordinary cocoanut of commerce. The nut has a very hard, woody shell, inclosing the kernel, within which again is a milky substance of a rather agreeable taste. The cocoanut palm is so widely disseminated throughout tropical countries that it is impossible to distinguish its original habitat. It flourishes with equal vigor on the coast of the East Indies, throughout the tropical islands of the Pacific, and in the West Indies and tropical America. It is most at home, however, in the numerous small islands of the Pacific Ocean.